Each year, CONA nominates and presents the Ray Merritt Outstanding Community Service Officer award to an officer who excels and makes a strong impact in the neighborhood(s) where they work. This year, Officer Josh Jordan earned this prestigious award. Officer Josh Jordan joined the St. Petersburg Police Department in 2011. Two years later, he was selected to be a member of the Downtown Deployment Team. After working many nights in the Downtown area of our City, Josh was then chosen to be a member of the District Two Community Service Unit. His strong interpersonal skills and results driven work ethic were a perfect fit for the unit. He wasted no time addressing various issues in his area. 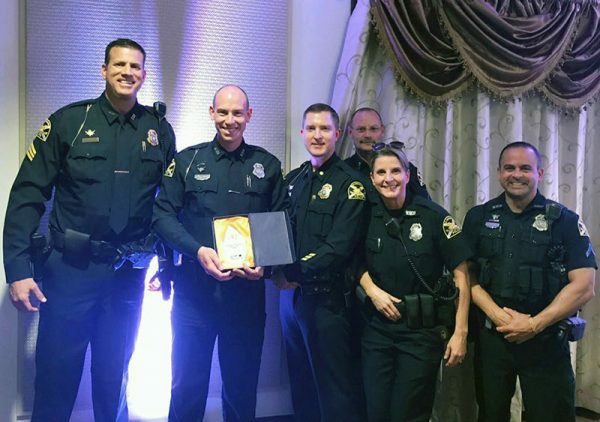 Whether curbing illegal activity in the early morning hours in dark alleys, or being a champion for animal lovers in the Crescent Lake Neighborhood, Officer Jordan has solidified himself as a high achiever and the “Go to” person for many tasks in the District. Officer Jordan is also a member of The Department’s SWAT Team. It is only fitting that he receive an award named after former District Two Community Service Officer Ray Merritt (retired), who possessed these similar skills and attributes. Josh is a 2011 graduate of Toccoa Falls College.